Making diagonal half squares is not that hard and they should not be feared. There are many ways to make them. You simply have to figure out which method works best for you. First, let's define diagonal half squares, so you are sure you know what you are making. 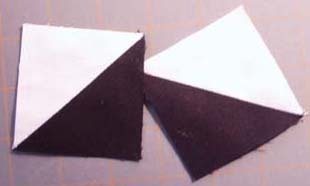 A diagonal half square is a square made of two different fabrics, with the halves being divided diagonally down the middle. These are also called half square triangles. Here are two black and white diagonal half squares. One very important thing in making any quilt block is knowing the correct size. You must understand what size you need. If a pattern calls for a 4 inch "finished" diagonal half square, that means the size that square will be when it is completely finished, sewn into the quilt. It does NOT mean the size the square will be when you are finished sewing the two triangles together. Remember this, or your project will never turn out right! Now what if you find a block you'd like to make but the directions are for a 12 1/2 inch unfinished block and you want to make a nine inch finished block. Let's use the shoofly pattern as an example. Not to confuse the issue, but ---- The "unfinished" or "raw" block size is 12 1/2 inches. You put it in a quilt, with other blocks, taking up a 1/4 inch seam allowance on each side. That makes the "finished" block, in the quilt, 12 inches. If the finished square is 12 inches, which means the size you see when it is in the quilt.